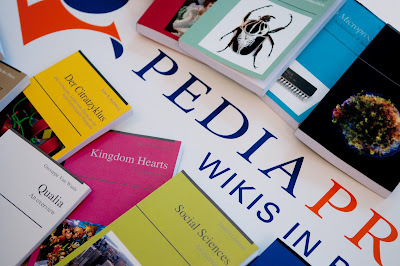 PediaPress Blog: What a Week For Wiki Books in Print! What a Week For Wiki Books in Print! It's been quite a week this past week, indeed! In all fairness, we've always known that the book creator is a great feature for Wikipedia and all wikis, but we were not so sure about our ability to show the world what great things you can do with it. Well, we didn't really have to, because it seems everyone picked up on how interesting, different, and not so crazy the concept of wikipedia articles in print really is. It all started with Techcrunch picking up the story of how Wikipedia and PediaPress Now Allow You To Create Books From Content In English. Mashable reported about how Wikipedia Now Lets You Order Printed Books and engaged its readers to ask themselves whether the Book creator was "a cool way to use free content" and whether they "might use PediaPress to create a book for [themselves] or a friend?". On Twitter, many people retweeted Techcrunch's or Mashable's articles, but some added their little comments. sutrav remarked that "PediaPress will take any wiki you want, typeset & print it and mail you the book" (well, any wiki that runs Mediawiki and the collection extension, really). Jay Walsh, Head of communication of the Wikimedia Foundation, of which PediaPress is an official partner, pointed out how it was "Time to make that 'WP's history of coffee table books' book! ", this while the Wikimedia Foundation Blog reported on how it gets easier to share free content thanks to the book creator. Paul M. Watson found that "The new Create A Book feature on Wikipedia works quite nicely for PDFs." and realised that you can then "get a printed book version of your Wikipedia book from Pediapress. Awesome." while, Tom Sepp called teachers to "Combine a wiki with print and digital publishing tools for a new way to produce educational resources". Meredith Blake of The New Yorker was sceptic at first, but then decided that a "customized Wikipedia book [...] now strikes [her] as a wonderfully democratic thing." And while Steve Attard decided that he "love[d] D way D publishing industry is changing..." [because] "Wikipedia And PediaPress Now Allow You To Create Books From Content", others started making their very own books. Lost remote made their very own "The Lost Remote Wikipedia Guide to Media", while Jesse CourteManche "finished compiling [his] PediaPress book on the roots of globalism; “Dawn of the 20th Century”. Well, these are just a few of the cool things we saw out there in the blogo-twitto-news-o-sphere and we're very grateful that our hard work was noticed and showed off as it was. It motivates us to do ever better and more for making the book creator a top tool for bringing wikis to print. As I write this, Steven Walling has just received the sample PediaPress book we sent him, let's see how he likes it. And actually, if you are a journalist and want to see what wiki books look like, don't hesitate to contact us.